This is two nights of data. I found a bunch of galaxies in the sky chart and figured it would be a cool image. If you zoom in and look, there are tons of little faint fuzzies every where. I don't have enough color data. I might do some more. That's a cool image Tolga! I have to say Tolga amazing image. When I clicked the image to view it full-sized, wow. At first glance its a bit overwhelming, I then began to slowly scan the image from left to right, starting at the top. That's when this image comes ALIVE! Wow, as I moved my eyes across it I begin to see more and more detail. In the spiral galaxies defined arches appear, elliptical galaxies start to reveal their center. The longer I look the more details appear, dust lanes, faint color, and I even see faint structure in a few of the smudges ( the faint fuzzies ). I'm not an imager at all, strictly just a visual observer. I never give advise or voice my opinion about what I think an imager should or could do. As I said I just observe visually and aside from sketching at the EP, I capture/image nothing in any way. I truly admire the hard work imagers produce and choose to share with us all here. The only comments I post about images that get shared are strictly complementary. Your image will be an acceptation to my rule. The only reason is because you state you don't have enough color data. I want to encourage you to do whatever you feel will bring out even more amazing detail than what you've already captured. If you feel you can put even more details into this image by all means, go for it. There is all ready so much detail in it, the longer I look the more I see. Images like this fascinate me. To me it's an images that deserves a second, third and fourth look. Every time I go back and look again, something new appears. A new faint fuzzie appears or dust lanes, another spiraling arm appear forming a complete galaxy. If you can bring even more alive and tease out more detail in this already fabulous image I cant wait to see that one. Sorry to ramble on about your image but it's one of the few I found myself going back to, to see what else I can see in it. Great job on this image here and keep up the amazing work. Thank you Allan, originally I thought what a boring target. Every bit of noisy looking thing in the image is a faint and fuzzy. I think there are many tens of galaxies in there if you look closely. I'm glad you enjoyed it. Maybe I'll go back to this and put some more time in. It is easy to count more then 50 galaxies on the picture! It looks amazing! So many galaxies. Beautiful to linger over. Can you say what scope and camera you were using? observing article, with photos by Ken Hewitt-White which appeared in the November issue of. SKY & TELESCOPE. 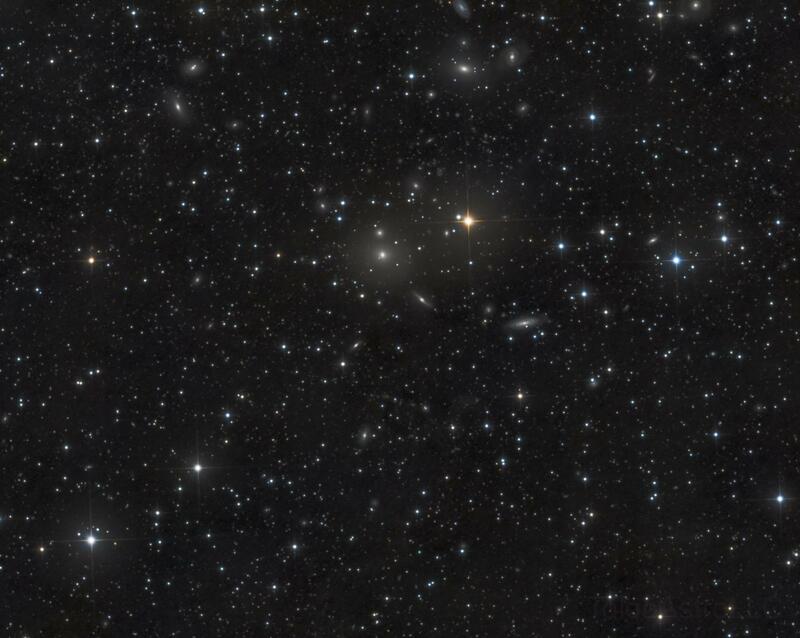 These galaxies are part of the Abell 194 galaxy cluster. Congrats on a wonderful image! Nice image of this field. BTW, NGC 507 and 508 are Arp 229. My field is too small to do it justice so my Arp 229 image doesn't begin to cover all the galaxies like you do. One thing I dislike about Astrobin's annotation is it covers things up. While it circles NGC 508 the annotation is covered up by the annotation for NGC 507. 508 is the circled galaxy directly above 507 on the edge of its halo. It is circled but because the annotation is covered up you didn't realize it was a major player of the group. Only the line to the missing annotation is seen. Also. while they correctly note NGC 506, it is just a field star the famous Lawrence Parsons (4th Earl of Rosse) mistook for a galaxy. Thank you Rick, Ron, Tom, Earnest and laixiaolue. And thank you for the information. Actually this group is in Triangulum. Very cool image with lots of NGC galaxies! This would be a fun one to try with PI's AnnotateImage script after doing a plate solve to see how many of them are picked up. You have some control over size of fonts, placement, etc. Checked my star atlas today, and according to MegaStar, the NGC-504 group is JUST across the border in Pisces. At any rate, it is a very cool group of galaxies. I've observed it visually, but now you have inspired me to image it! I see some IFN there too. Very cool image! Edited by tolgagumus, 24 October 2017 - 04:54 PM. Always love these galaxy clusters!! So well done. Tolga: "I found a bunch of galaxies". Yes you did. Yes, you certainly did! Wonderful! Love these deep cluster fields. I really like your annotated image but let me suggest that you bump the font size up a bit. Older eyes might have trouble making out the numbers...like at all. Of course, I don't have that problem.